Become an Infatuation Scripts Affiliate! Join one of the Newest, Highest Converting Affiliate Programs on Clickbank! Enter Your Details Below To Get Instant Access Now! We don't sell, rent, lease, or give away user email addresses. We will not share your email information with third parties. 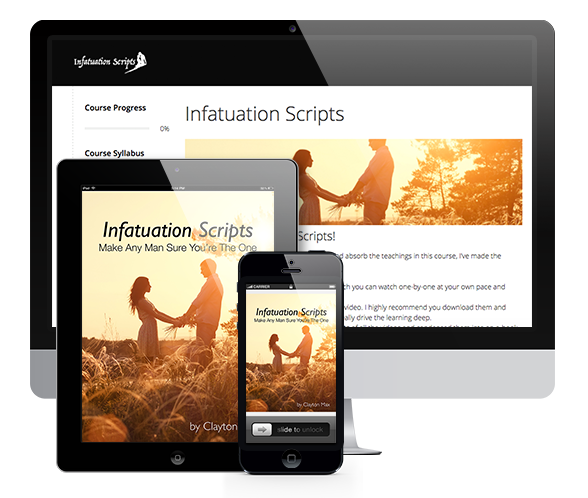 Infatuation Scripts pays you 75% for EVERY sale referred (plus 75% on backend and 35% on recurrings). This course is currently converting like CRAZY for our affiliates and is the perfect program for you. Find out why this is such a fast, easy seller for your lists with a low refund rate. The possibilities are endless! You make industry-leading 75% commissions on the frontend, plus ongoing 35% recurring commissions (about 65% take this upsell). The team at Infatuation Scripts pride ourselves on maintaining a strong brand and reputation. For this reason it is strictly forbidden for affiliates to attempt to pass themselves off, or misrepresent themselves, as being owners of the Infatuation Scripts product. It is forbidden to bid on search terms "Infatuation Scripts," "Make Him Sure," or similar brand search terms, as this effectively steals commissions from other affiliates. We welcome affiliates to use our imagery and promotional material in conjunction with their affiliate promotions, however it is important to distinguish yourself as an affiliate or reviewer, and not the owner of the Infatuation Scripts product. This offer has been created by the applicable vendor and not by ClickBank. Accordingly, ClickBank is not responsible for any information contained in the offer, including, but not limited to, any product information, promotions, incentives, expected returns or other information contained herein. In addition, ClickBank is not responsible for any links to third party websites in conjunction with this offer. Such links do not imply any endorsement by ClickBank of such websites or the content, products or services available from such websites. By clicking on or accessing a third-party website listed, you acknowledge sole responsibility for and assume all risk arising from your use of any such websites.